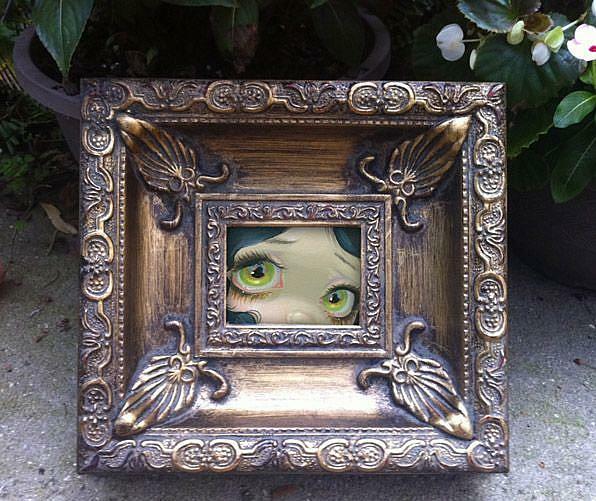 I have one of my new mini paintings up for auction here: http://www.ebay.com/itm/380535213463 - this is the original painting, already framed - just a little study painting of some beautiful big eyes! Bidding starts at just a penny, click the link to see details. Often when developing new characters or ideas, I paint small/miniature pieces trying out new ideas or refining old ideas. My husband Matt suggested that fans and collectors might want these tiny paintings, so he has cut this one down & framed it in an AMAZING ornate frame that really makes it "pop"! Even though the painting itself is only 2.75"x3.5" in size, with this deep gorgeous frame it is almost 10" wide by 9" high and a DEEP 2" thick. This beautiful ORIGINAL PAINTING would be a fun & intriguing addition to any wall, nook or cranny! Be sure to see all of the great photos of the frame & size info in this listing. My own original acrylic painting (not a print or reproduction of any kind, this is the ACTUAL original painting).